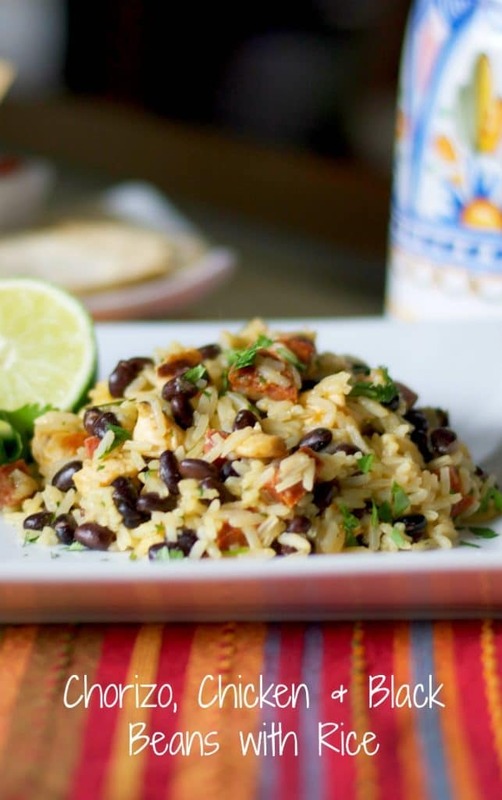 Spanish chorizo, boneless chicken, black beans and Jasmine rice combine with zesty lime and cilantro in this deliciously easy one pot meal. 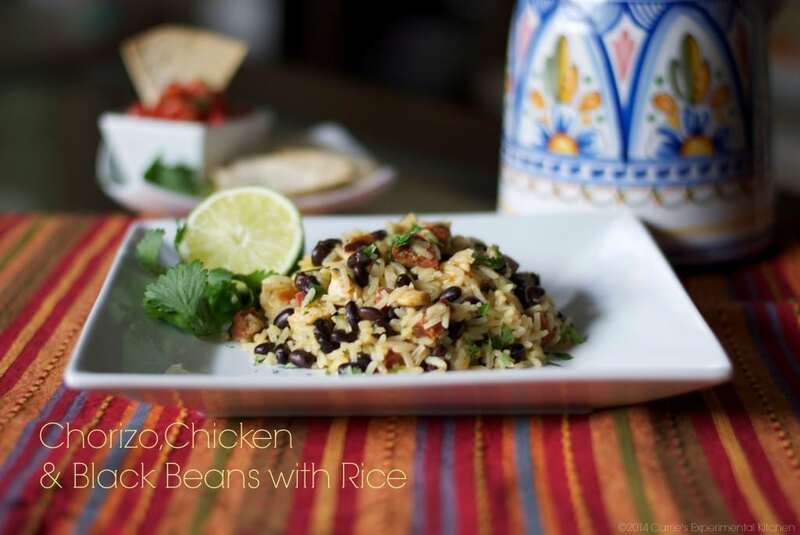 Cinco de Mayo is coming up on May 5th and as I was looking back at some of my older recipes I found this recipe for Chorizo, Chicken & Black Beans with Rice buried in with a roundup post from two years ago and I thought it deserved the chance to shine on it’s own. It’s incredibly delicious and SO easy to make. I also love how it’s a one-pot, all-in-one kind of meal. It just makes preparing dinner that much easier don’t you think? 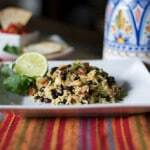 Chorizo, chicken, black beans, rice, fresh lime and cilantro make this dish incredibly festive for your Cinco de Mayo celebration, or any time of year for that matter. ~Enjoy! Heat oil in large non-stick saute pan over medium heat; then add the chorizo and garlic. Heat sausage for approximately 5 minutes; set aside. Add chicken to the same pan and cook through until white approximately 5 minutes; set aside. Add the butter, rice, lime zest and juice to the same pan and allow to lightly brown for about 2 minutes; then add the bouillon cubes and 1 cup of the water. Reduce heat to a simmer and cover. Allow liquid to evaporate then add another cup of water. Repeat for the third cup of water. When the liquid from the third cup of water is almost evaporated, add the black beans, cilantro and the cooked chorizo, garlic and chicken. Stir well and garnish with chopped cilantro. So you cook everything in one pan? Thanks. Found this recipe while googling the random ingredients left in my kitchen before moving out. Thanks for providing a delicious and easy recipe for them! Loved this dish! Thanks for sharing such an easy recipe! You’re welcome, I’m glad you enjoyed the recipe!